“I ain’t interested in getting mangled and embarrassed”. 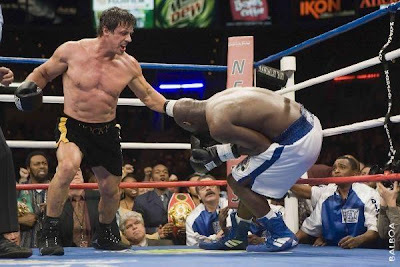 That’s what Rocky Balboa (Sylvester Stallone) tells a boxing agent halfway through his latest film; but if avoiding embarrassment is what Rocky wants, then one would imagine climbing into the ring to face a champion half his age would be something best avoided. Nevertheless, that’s exactly what Stallone has done for this, the sixth film in the Rocky series, and the appearance of this picture some 16 years after the series completed its descent into self-parody with Rocky V is hardly a film we’ve been awaiting with bated breath. So where is Rocky now? Well, he’s still living in Philadelphia, where he holds the status of local hero, and he’s now running a small Italian restaurant named Adrian’s, in memory of his late wife who has passed away. The shadow of the past hangs heavily over the film’s early scenes; on the anniversary of Adrian’s death, Rocky takes his reluctant friend Paulie (Burt Young) on a nostalgic tour of the places which were important to him in years gone by, and the past has also disrupted his relationship with his son Rocky Jr. (Milo Ventimiglia), who is embarrassed by people only ever seeing him as his father’s son. Even at his restaurant, people seem more interested in hearing fight stories and getting a picture taken with the former champ than they do in having a good meal. In fact, the first half hour of the film is pretty much all nostalgia - even when Rocky strikes up a new relationship with barmaid Marie (Geraldine Hughes) it turns out to be ‘Little Marie’ from the original Rocky all grown up - and the effect of this endless navel-gazing makes the opening section of the film feel rather maudlin. Yes, there’s an irresistible quiver of excitement to be had when the opening credits start running to the sound of Bill Conti’s classic theme, but our affection for the first Rocky film has its limits, and the film sticks so rigidly to the formula established by the previous efforts that we begin to wonder if Rocky Balboa has anything new to offer? Thankfully, some sort of plot eventually kicks in and this film gradually begins to find its own identity. The opponent this time is Mason ‘The Line’ Dixon (Antonio Tarver), a young champion whose frequent easy knockdowns have seen the public turn against him, showering him with ice as he tried to leave the ring after a recent quick-as-a-flash victory. With many people decrying the state of the modern fight game, ESPN sets up a computer-generated match between Rocky and Mason - two champions separated by three decades - and Rocky’s victory seems to provide more evidence that standards are slipping in the boxing world. When Rocky himself sees this broadcast, it seems to unlock something inside of him, and he starts feeling the urge to pull on his gloves again. He applies for a licence and begins a bit of light training, and when Dixon’s management team hear about this development they come up with the bright idea of an exhibition match between the pair. I know what you’re thinking, this all sounds very silly, and to be honest it is. As well as being rather silly Rocky Balboa is clichéd, cheesy and structurally lopsided - there’s no way it should work as well as it does. But Rocky has never really been about subtlety or nuance, it’s all about heart, and that’s something Rocky Balboa has in abundance. Stallone’s screenplay continually returns to the same themes - follow your dreams, believe in yourself, take the hits and keep on going - and while these ideas may be played out in simplistic fashion, often through impassioned speeches from Stallone, they’re expressed with a sense of integrity and self-belief which is touching to witness. At the centre of all things Rocky is Sylvester Stallone, and his performance here is one of the main reasons for this movie’s unexpected impact. It’s hard to avoid seeing Rocky as an approximation of Stallone himself; after all he was the young unknown who came out of nowhere to live the American dream in 1976 - he was Rocky - and over the subsequent years Stallone took a number of beatings, with his films being critically derided and often ignored by the public. Now he is seen by many as something of a joke, a dinosaur in a young man’s game, and in Rocky Balboa he seizes his chance to stand up to his critics and show them he’s still got what it takes. Perhaps Stallone’s affinity with the character is what gives his lead performance such an unaffected air of naturalism and lived-in depth. As an actor, Stallone has always had clear limits, but here he manages to give a tender, expressive performance full of humility and pride. There’s something engaging about that oddly lopsided, hangdog face of his, and his slurring drawl is perfect for the large amount of self-deprecating humour and homespun philosophy which is present in the screenplay. He infuses his part with real emotional weight, and it won’t take long for Rocky to have you in his corner, cheering him on yet again. The rest of the characters are painted in broad strokes, with Mason Dixon and Rocky Jr. suffering from poorly-developed parts; but Stallone gives Burt Young and Geraldine Hughes plenty of room to work alongside him, and they both offer strong support. Young’s performance is particularly enjoyable - full of sardonic humour - and the film benefits from a real sense of affection between Paulie and Rocky. Rocky Balboa just about gets away with the lethargic pace it employs for its first half, and it’s a relief when the big fight looms on the horizon and the film really springs into life. There’s a classic training montage, with Rocky lifting weights, punching slabs of meat and - of course - running up the steps of the Philadelphia Museum of Art. That montage tells us that Rocky is back, and the climactic fight - which takes up most of the film’s final twenty minutes - is as big and bruising as any which have gone before. Extremely well edited, the bout sees past and present colliding as memories of Rocky’s earlier encounters bleed into his titanic battle with Dixon, and the result is a supremely exciting and involving 10-rounder. Of course, you can see how the movie is going to end from pretty much the first frame, but that doesn’t really seem to matter this time. “What’s crazy about standing toe-to-toe with someone and saying ‘I am’?” Rocky asks when people question his decision to get back in the fight game, and Rocky Balboa emerges as a fine testament to an old man willing to go the distance even if his best years are long behind him. This is a rousing and surprisingly moving underdog tale which overcomes its various flaws through sheer will, relying on the big-heartedness of its story to win the audience over, and it’s ultimately a triumphant return for Sylvester Stallone. He has given a sense of dignity back to his most enduring character, and in doing so he has reclaimed his own reputation. He has fully earned this final round.